Did any of you wake up early for the new Jason Wu for Target release? The fashion blogosphere was in a frenzy over the sure to sell out and end up on Ebay for a ridiculous margin collection. I've learned that as much as I want to have the designer goods at my more reasonable modest budget, the quality simply does not live up to the hype, no matter who the designer is. Several years ago, 2004 to be exact, I was fortunate to be in London during the launch of the Lagerfeld for H&M collection. This was before social media made all launches a ridiculous camp out event. I didn't stand in line, I didn't even know it was there. I was shopping and saw a store that we didn't have in Dallas with cute clothes so I went in. At the time, I was confused to find Karl Lagerfeld at H&M and thought that he sold his line through H&M the way that designers sold their clothes through Dillard's and Macy's in the US. So I was thrilled that I could afford a Karl Lagerfeld dress! I thought I'd scored the steal of a lifetime! It wasn't until I came home and wore my dress that I started questioning the quality. I thought I was crazy that some of the seams looked uneven and that the dress wasn't properly lined. There were also stray threads everywhere and I must have worn it two or three times before it pretty much disintegrated despite me only dry cleaning it and being super careful. After some research, I found out that my dress had probably been a return as the line had sold out in one day, but it was a one time collaboration. I was upset that I didn't have quite the investment piece I imagined. I wasn't deterred, in 2007, I was working for a Telecommunications company. I had a major presentation, my first in a new role and wouldn't you know it that I scheduled a wild night out with the girls? I ended up spending the night at my friend's house and had to hoof it to work the next day. I couldn't show up in the previous night's party clothes, so I stopped at Target in a not so nice area of town. I grabbed a black pencil skirt, a sleeveless shell and a Proenza Schouler for Target cardigan. By then, I'd learned my lesson and wasn't expecting much, I just wanted a disposable sweater and wasn't even surprised that the pockets weren't actually pockets! I still have the cardigan and wore it here and here. By the time H&M paired with Jimmy Choo in 2010, I was over designer collaborations. I love Jimmy Choo and I have several pairs that I love and cherish, but there was no way that I was going to fork over $150 for rubber soles and ill-fitting pleather. If you are very patient, diligent and keep your eyes peeled, you can sometimes score designer shoes (not diffusion) for the same price, with leather soles and real leather uppers! 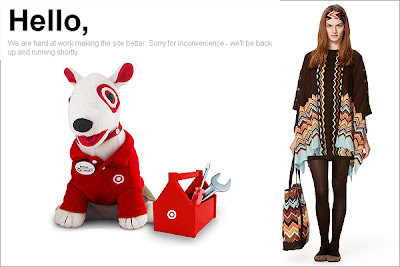 More recently, the Target collections have turned into PR nightmares for the company. The Missoni line sold out in stores and crashed their website. Resellers had the entire collection on eBay and were gouging shoppers unfortunate enough to want the iconic pieces. I bought a skirt, worn here, and again, there were multiple construction issues. I would have been PISSED if I'd bought it for a ridiculous price on eBay. The other item I bought, a small blanket, I actually love and will be taking in my carry on bag this coming week. So today, I didn't set the alarm. I woke up at 9AM on a leisurely SuperBowl Sunday, drank the cappucino that Mr. Fantastic made for me, and drove to the Target by my house. All of the outfits in the first photo were completely sold out and the only things left were all the floral printed items. I looked them over; again, wasn't impressed by the quality and I put the items back down. 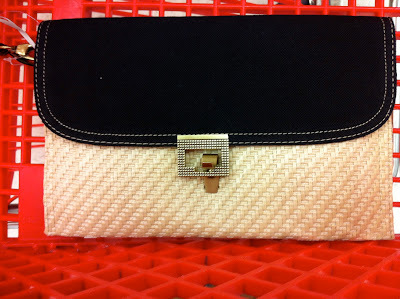 I was really only looking for the straw and black canvas clutch. I walked by again and saw that two were left. I was initially excited because I thought I would pick up an extra one as a gift. Upon closer inspection, you can see in the photo above that the flap is not even on one of the bags. I took the photo below to show where the clasp SHOULD have been placed in order for the canvas flap to be even. So, I ended up only picking up one clutch and leaving the lopsided one behind. My lesson is that I don't buy clothing from diffusion collaborations anymore. I like the Missoni blanket and I liked some of the Jimmy Choo for H&M Jewelry. 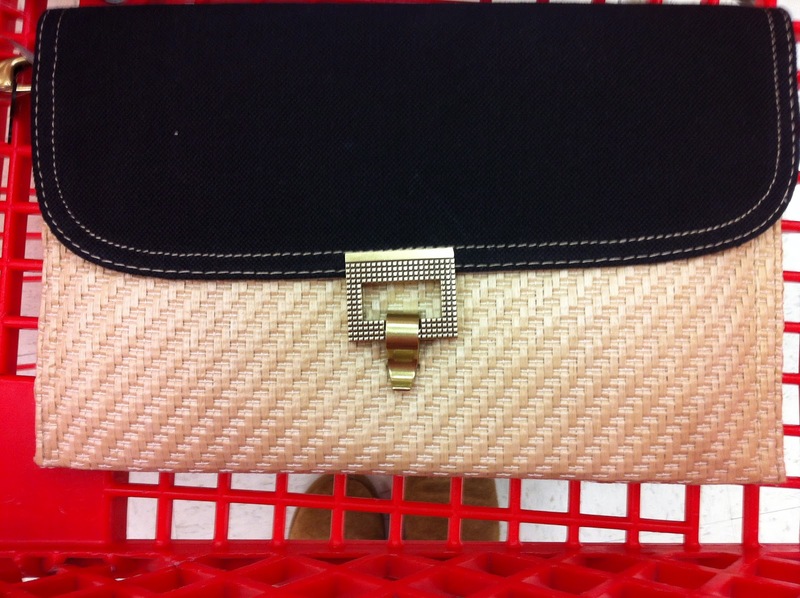 I am hoping that I will love this clutch because $30 is about all I want to spend on anything made of straw. What do you think? Is $30 a steal for a lopsided bag? Did anyone score any goodies during the shopping madness this morning? All images except for the last three were found via Google Images. As much I don't want to agree with what you wrote, I do agree. I wanted to believe that Jason Wu's for Target was going to be better than expected, but I was quite disappointed in the one piece I did manage to spot at my local Target. I was hoping designer brand for less without skimping on the quality. I am waiting for the collection to be restocked so i can check out the rest of the collection as well as accessories. I was looking forward to the straw clutch and lace clutch as well. By any chance did you get your hands on the lace one as well? Would love to hear a review for that. Thank you, thank you, thank you for saying that the quality never lives up to the hype. FINALLY, someone understands my point of view.